For me, a pillow is the difference between a good nights sleep and an overnight disaster. I think my Exped 'comfortfoam' pillow would have to be my favourite bit of camping gear… and I've got some pretty neat stuff. Over the past couple of years it has offered exceptional comfort with a somewhat negligable weight penalty time after time again. 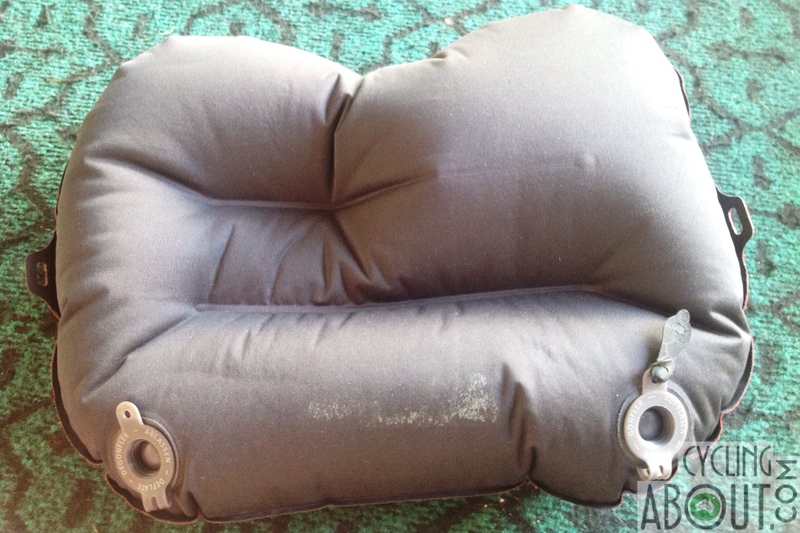 I actually have two Exped Air Pillows. 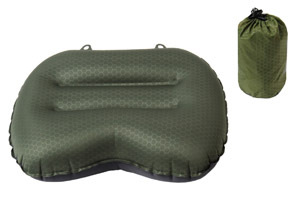 One is the standard 'air pillow' and the other is the 'comfortfoam' model. The Exped air pillows are a super light, super small product which takes away any excuse to not bring a pillow on your tour. The comfortfoam pillow is slightly larger and bulkier, however offers a better simulation of your pillow that you've left at home. Once blown up, both pillows look the same: they are both identical in size and shape. If you touch the surface of the comfortfoam model you will realise it isn't just a bit of air in a rubber casing. In fact, the foam filling makes the speed at which the pillow responds to small amounts of movement noticibly different. It is actually insulated with pellets of high grade open cell polyurethane foam recycled from the production of other Exped mats! The “tricot polyester” material that Exped use for their air pillow has a really soft feel to it. It actually feels similar to some of the lightweight quick-dry towels available; most notibly the MSR PackTowl Ultralite. With either of the Exped models, the shape is a little higher on one side, a little lower on the other and is contoured in the middle. These higher and lower sides allow people who sleep on their back to have a bit more support by using the higher side closest to their neck, or for stomach sleepers the lower side closest to their neck to reduce any strain. This variation in shape makes it easy to find a comfortable position and is probably the main reason the pillow is so comfortable. The operation is simple. 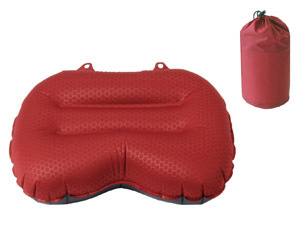 There is an inflate valve and a deflate valve hidden under two covers. With one breath I can inflate the pillow to full capacity; minimal effort after a long ride. You can let out a small amount of air by lightly pushing the inflate valve if you need to make small adjustments. We feel the pillow is most comfortable with a bit of air missing as it softens the pillow up and simulates our home pillows slightly better. I haven't had to repair mine at all, but they come with a little patch kit and some glue to ensure that you will not get yourself into any trouble! Over the past two years, we have had two failures with the standard air pillow. The first we estimate had 150 sleeps on it, and the second over 300. Unfortunately the inner stitching comes apart over time, which means the pillow is still usable, but doesn't hold the right shape. We have now replaced the standard pillow with a comfortfoam. We have never had an issue with the comfortfoam model, and hence recommend it for heavy users like us. Not only are they more durable, but also more comfortable! Exped are brilliant with warranty: literally two hours after emailing we had one in the post. It is quite impressive that this is my “favourite bit of camping gear” considering how simple this product is. But when a simple product like this makes my life easier, I have no doubt in awarding it with this title. The shape of the pillow caters for all types of sleepers. The weight and packed size of this item is damn impressive. The polyester material that is used is nice on your skin. It is quick and easy to blow up. Stop folding up your jumper into an awkward shape and get yourself an Exped pillow. A great nights sleep, guaranteed.